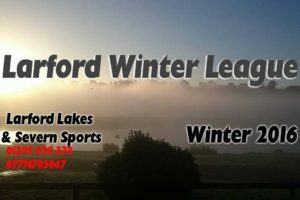 The 14 teams came together again at Larford for the Winter League Round 2 to fish the Match & Specimen Lake. Freezing cold conditions and heavy wintery overnight rain made for very difficult weights. Method was Pole at 14.5m with hard banded pellet. 2nd on the day was Neil Colcombe (Golden Reel / Larford) who weighed 64-10-00 from peg 77 on the speci Neil caught on Method feeder and short. 3rd on the day was Darren Fisher (Old Ghost) who drew peg 37 on the Match Lake weighing 62-04-00 on pole & pellet. 4th placed Danny Bache (Winter Wonders) drew peg 8 on the Speci Lake and weighing 57-05-00 on Method. 5th on the day was Warren Jennings ( winter Wonders) who drew peg 46 on the Match burr weighing 57-02-00 on the waggler. 6th placed Chris Cameron (Muffers Divers / Middy) drew peg 48 on the match lake catching on the Method for a level 50lbs.